The latest controversy to come out of a Starbucks left a University of Pennsylvania graduate student feeling bad about his stuttering disorder after a staff member of the coffee chain mocked his stutter. The incident comes just 29 days after the company closed all 800 U.S. stores for "anti-bias training" after two black men who were loitering in a Philadelphia Starbucks refused to leave the store and cried racism when police arrested them for trespassing. The incident in Pennsylvania happened to a 28-year-old student at Wharton School who says he was shocked to hear a barista mimic his name saying, "OK, S-S-Sam." The student was even more disturbed when he noticed the barista wrote his name on the cup as "SSSam." Sam asked his last name not be published but said, "It’s rare, as an adult, that that kind of disrespect happens. It happens, but it’s really rare to see it in print." "We are taking this incident seriously, and we have begun a full investigation. We have a zero-tolerance policy for any kind of discrimination. We don’t feel like this [discrimination] is reflective of our values or of our mission. We want everyone who comes to our stores to feel valued and to have a positive experience." Sam said Hymes called him around 3 p.m. Monday. "As someone who studies these kinds of things corporate decisions and operations, I believe she was sincere in her apology," he said. The Philadelphia Starbucks at 3401 Walnut St. left Sam feeling more shocked than angry. "It felt rude," he said. 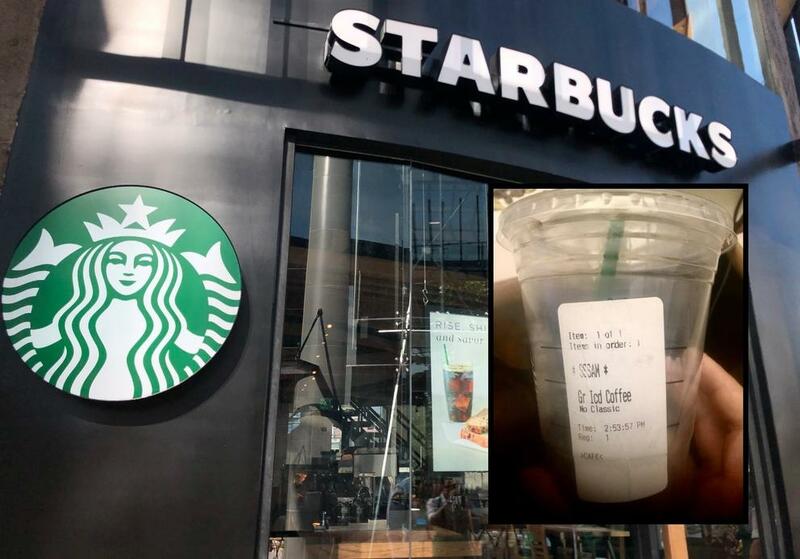 He initially emailed Starbucks' customer service department about the incident and he received an apology and a $5 Starbucks credit which he felt was insulting. "I thought it was kind of insulting," Sam said. "I also thought they didn’t take my issue seriously. It was as if they give $5 to anyone who complains about anything. I sort of got a generic email, and I didn’t feel like I was heard." My daughter reminded me that Starbucks locations allegedly recently closed for sensitivity training. Obviously, it didn't work. "Barista" needs to be fired!